We made the move to the Salmon River, more on that later. 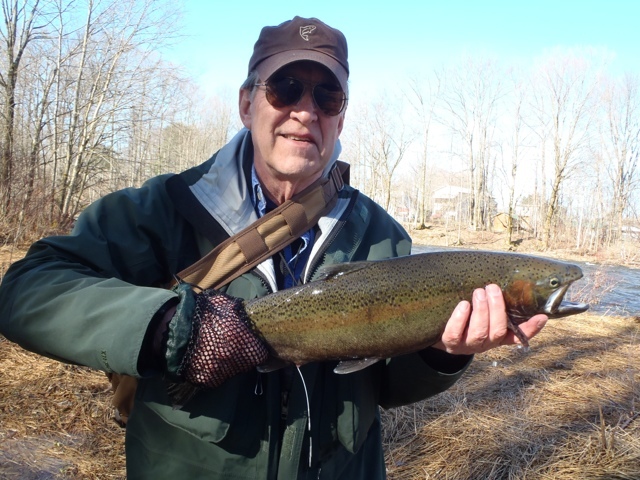 Starting with western NY, Steelhead fishing continues on the Oak Orchard, however the water is very muddy. The fish are hard to see in the mud but they are there. I suspect there will be steelheads coming and going for two more weeks. If the muddy water is heavy, remember the fish are still in the same spots they were before the water went up. For flies, use the big colorful flies that we like to tie. The trout fishing on the inland streams should be going by the end of the week. Water flows are quickly coming into fishing conditions. I would expect to see the first hatches of this trout season soon. The two mayflies we should be seeing will be Quill Gordons and Hendricksons. Expect to see these mayflies hatching mid-day. The steelhead fishing on the Salmon River has been challenging. Not because of lack of fish, but due to river conditions. Cold water temperatures have made the fish reluctant to take. One day they are seriously on the bite and the next day they could care less...typical steelhead. Now we are dealing with extreme high water conditions. As of writing this report the River has blown up to over 4000 CFS and will go as high as 7,600 CFS. This will most certainly bring in the last of the Steelhead. Extreme high water events such as the one we are experiencing now, generally do not last much longer than 24 hours. And since water temperatures have improved considerably, I expect to be back on the water very shortly. Probably in a day or two. Once we get back on the water, we should be finding steelhead spread out and spawning on the gravel beds. We can also find fish starting to go back on the feed holding in the pools. For now both due to the high water and spawning related habits, most of the fish are in the upper river. Productive flies are egg patterns. We have been doing well with a size 8 Oregon cheese nuclear roe bug. Black stone flies and size 6 black woolly buggers have also been taking more than their share of fish.